It is written that the correct number of bikes is n+1, where n is the current number of bikes owned. It ran RockShox Quadra elastomer forks, a mongrel groupset including an RSX road rear mech (in a bid to reduce chain slap), cantilever brakes, Club Roost bars and X-Lite bar ends on a Control Tech stem, a Flite Ti saddle on a USE seatpin and lots of other old-school goodies. Shifting was by SRT500 GripShifts. 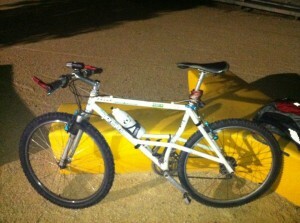 It ran a seven-speed group, 8 speed having been an emerging standard at the time I was riding. The riding position was about as low and long as I could get it. The suspension travel was, frankly, negligible. But it made a real difference in fatigue over longer, rougher rides. It had got me round a lot of decent riding, a few local-level races and one sort-of disastrous Polaris Challenge back in the UK but had fallen into disuse over time. So I used it to lose some weight, and around the time I hit my first big weight-loss target, it started to show signs of impending death. The chainrings were worn and slipping, the rear braking surfaces were nearly gone, the seat tube was showing a crack, the 7-speed rear cassette was almost dead and the gripshift SRT500 shifters were cracking with age. 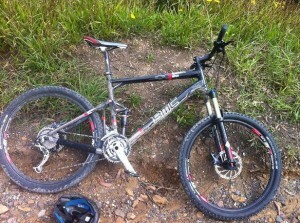 So I retired it, in favour of a BMC Speedfox SF03. The Speedfox was a proper eye-opener. Badged up as a ‘marathon bike’, it was really more of a trail bike in character, 26″ wheels with 120mm of travel at either end, big 180mm rotors and a quite high riding position, but with some tweaks I made it faster and pretty soon I was addicted to the dual suspension concept. The groupset was a mixed XT/Deore affair, with trigger shifters (which were quite an adjustment after years on GripShift) with Avid brakes and a lot of BMC-own-brand Scor equipent. This bike and I had a lot of fun, doing everything from long firetrail days to twisty singletrack nonsense, road rides and a two-day crossing of the Blue Mountains. I even raced it at the 2012 Careflight Oaks Classic. I really liked this bike. A lot. 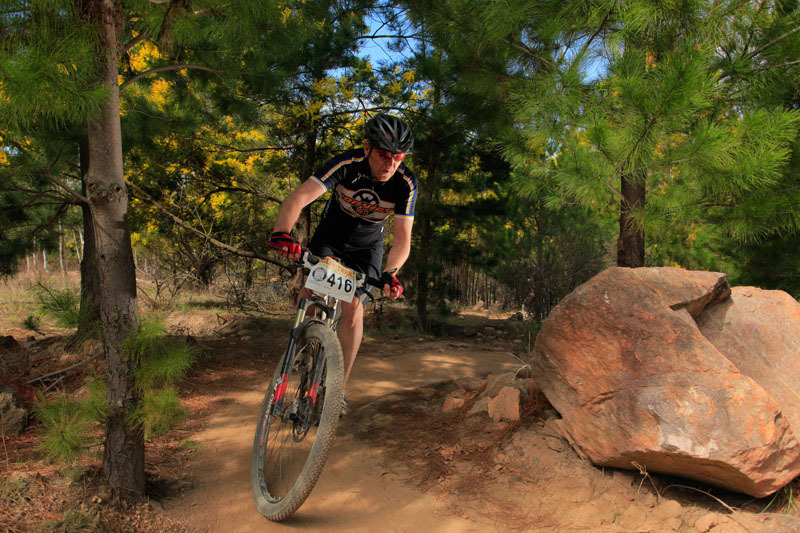 Then one day I was toddling down the Temptation Creek firetrail in Loftus when I heard a loud cracking noise and felt the ride quality go suddenly floppy. Turns out I’d snapped the seat tube clean through at the suspension pivot. At some point the bike had taken a critical hit and the weakened seattube, while it held together for a while, was doomed. 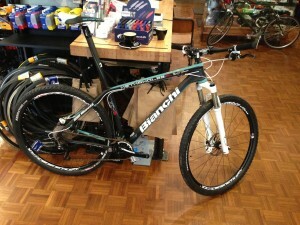 So it went in for warranty assessment and, thankfully, BMC judged it to be a replacement deal. 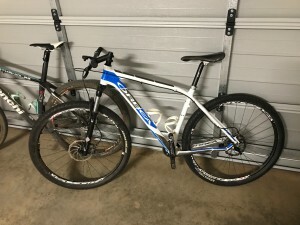 So, they asked if I’d be OK with an upgrade to a Speedfox SF29 – a revised, 29″ FS bike with a broadly similar design, but a more aggressively XC-focused tweaking. And that’s where things got fast. 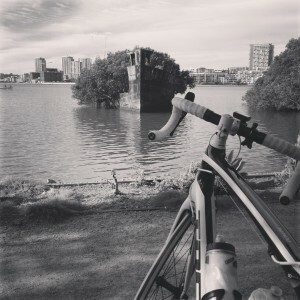 Pretty much every time I took the bike out, I was knocking over a string of personal bests. 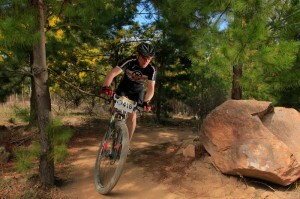 I raced it to 4th in category at October’s Kanangra Classic 100km race, and I was pretty much hooked. It’s a quick bike. In the first month and a half I put down 1800km and had to replace the rear tyre. I rode it up – and down – Mount Hotham, started knocking over a few Strava KOMs and lost even more weight. So the bike had to start losing weight too. The wheels were upgraded to Hope/Crest, the bars were replaced with narrower RaceFace carbon bars. The rear brake got reduced to a 160mm rotor rather than the huge 180mm stock unit. The Scor saddle got swapped for a Fizik Tundra and the riding position got ever lower and faster. The Shimano SPDs got swapped for far more effective (for me at least) Crank Brothers Eggbeaters. It still runs a triple, because I do enough fast firetrail riding to justify a bigger gear (such as the Annual Oaks Classic smashfest) and I still commute it a fair bit. During this period, I also acquired two loaners from my Girlfriend’s dad, who wasn’t using them and was glad to get them out of the way. An Avanti Hammer 26″ Hardtail with 125mm of travel in the fork, and a Giant Peloton 8200 road bike. [Pics here]. I don’t actually use these a lot. The hardtail is usually a loan bike for my bikeless mates to borrow when I can cajole them into a trail day. The Giant roadie was reserved for occasional commutes and attempts at Strava segments out of the reach of the Speedfox. The ride is a bit harsh, and the geometry a bit tricky, and the riding position not quite right. But that didn’t stop me taking it on holiday to the NSW Central Tablelands, since there was an opportunity to ride the Mount Panorama racing circuit while I was there. It turned out to be somewhat overgeared for the 20-odd% pitches on the raceway. And the riding position resulted in me lurching off the bike at the end of the day with a wrenched shoulder. So when we wandered into a bike shop in Dubbo a few days later and spotted a compact-equipped Trek Domane 4.5 on sale, +1 happened again. Sold to the bloke with the now very full spare room. The Domane is, of course, the frame design that took Fabian Cancellara to multiple classics wins this year. So it’s designed to take a bit of a kicking and is therefore ideal for a mountain biker making a transition to the road. The ISOSPeed flex system really seems to work and this has become my go-to commuter bike, as well as a fantastic speed weapon for long weekend rides and Strava smashing sessions. It’s also getting occasional upgrades as things break – such as a pair of Zipp 30 semi-toroidal wheels. It also runs CrankBrothers eggbeater pedals. Some roadies would raise an eyebrow at this, but then I’d just get off my bike and walk comfortably and safely up the Harbour Bridge steps – or across the pub to the bar – rather than hobbling on my oversize road cleats. I don’t have to worry about different shoes and that’s great. They’re also light. and low-profile, though I still occasionally put them on the ground in corners as I’m getting used to the whole road bike thing. The bike is also black and white, just like my Speedfox. Which is nice. I’m becoming quite habituated to the roadie thing, and I’m now completely sold on Carbon Fibre as a frame material. 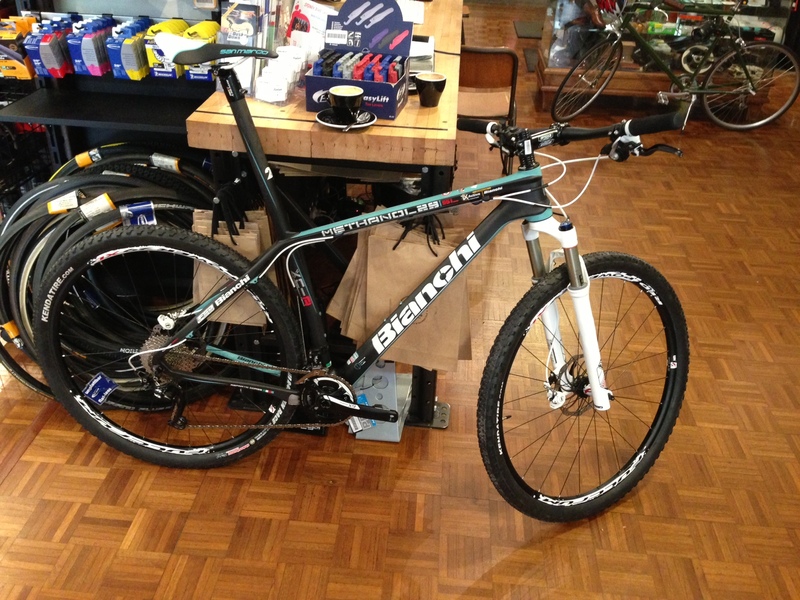 So much so that in September 2013 I put down a deposit on a Bianchi Methanol SL 29 Carbon hardtail to fill out my MTB racing stable. Unexpectedly, my ever resourceful girlfriend secretly paid off the balance and smuggled it home in time for my 39th birthday. It weighed just over 10.8kg in off-the-peg state, and dropped to 10.3kg with my Hope/Stans race wheels. A couple of considered upgrades dropped it it nicely under 10kg. This was bought almost specifically for the well-groomed racing around Canberra – especially Stromlo, where it’s pretty damn fast. The lack of seatpin adjustment means it’s not a do-everything utility bike, and can be a bit sketchy on steep technical descents, but that’s not what it’s for. 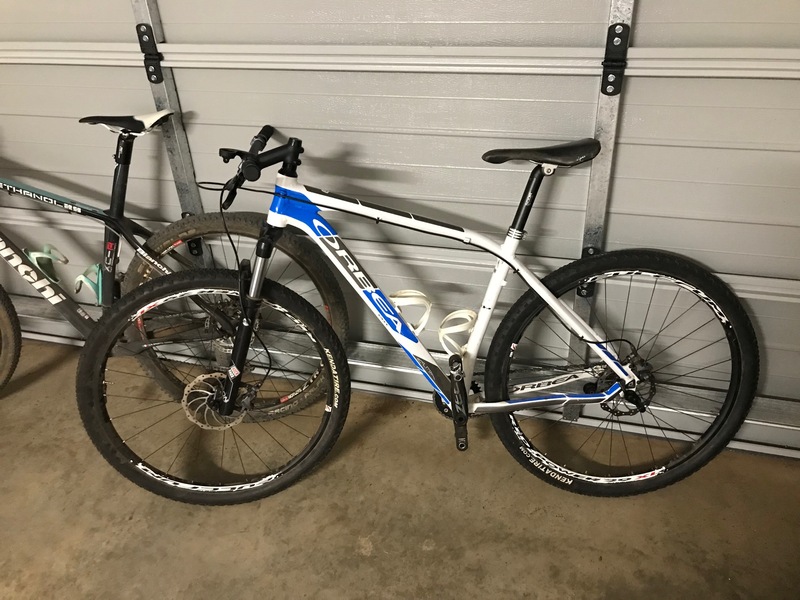 This is now my primary bike, and after moving to Bright, it’s stayed my faithful companion, even though it’s super-sketch on a lot of Mystic’s trail bike oriented black trails. As you can see, it’s got a deeply negative stem (because it’s surprisingly tall at the front). It’s fantastic for blipping up and down the Murray To Mountains Rail Trail, doing shopping with a trailer on the back, and generally being a simple, low maintenance thrashabout. It’s gone offroad on the flatter bits of Bright’s singletrack, and it’s epic fun even if the adjustment from a geared XC hardtail is a bit weird. Also, it’s now my only bike still on inner tubes. I’ll fix that eventually. After this little lot, I’m in the market for a Gravel Grinder – because there’s an absurd amount of backcountry gravel here in the Victorian Alps, and I need a winter weapon for when the snow rolls in. I’ve got my eye on a couple of beauties and when eventually one arrives it’ll find its way here. Cyclocross racing is also a bit of a thing here in the winter, so a CX bike would be nice. But I’ll take the grinder first, thanks.